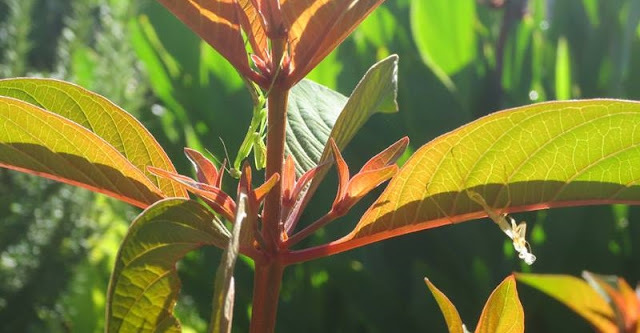 On my front flowerbed this morning, I spotted a tiny praying mantis, and right alongside it, hanging from another leaf, the ghost of a mantis, which I presume is its recently shed coat. As I watched, a large moth landed on the next stalk. I wondered if the mantis was praying that the moth would alight a bit closer. I prayed that it would--I wanted to see how the mantis would go about preparing its meal, as the moth was three times the size of the mantis, and could easily crush its head, just by sitting on it. Still, it put me in mind of an incident that took place in Tripoli, Libya, just after I'd moved into a tiny villa in the residential area known as Georgimpopuli. In lieu of a Throwback Thursday photo, I thought I'd share that little anecdote. My Austin front yard, June 2015. Praying mantis on flower stem in the centre. Ghost mantis on the right. "On Graham's heels arrived a couple of oil company workers to spray my little villa for pests. When they'd finished and I was showing them out, I noticed an enormous bright green insect on the front porch wall. It was at least four inches long, with a three-foot wing span...all right, the wings spanned about four inches, but that was scary enough for me. I grabbed one of the men by the arm and shrieked so loudly, his eyes nearly popped out of his head; poor fellow had no idea what was wrong. The language barrier didn't help, but with me jumping up and down, gesticulating wildly at the bug on the wall, he finally worked out what I wanted. He transferred the creature into a nearby flowerbed. "Grazie," I said, "Molte grazie!" I moved a bit closer to observe it. "It is beautiful," I said, pointing to the insect sitting innocently on the ground, "but I feel much better now it's ten feet away from me!" Unfortunately, I was misunderstood. One of the workers trod on it with his black leather loafer. I didn't want it to die; it was a splendid bug! Bloody language barrier. After they'd gone, I took a good look at it lying dead and realized that it was a praying mantis. I'd never seen one before; it was incredible. It really did look as if it was praying. I still feel guilty for having a living thing murdered. Mind you, had it been a spider, I'd have pulverized it with a shovel, just to be sure.